After five days of amazing action, the final curtain has fallen on the PokerStars and Monte-Carlo® Casino European Poker Tour Grand Final. 665 players entered the biggest tournament in Europe, but there could be only one winner and his name, is Mohsin Charania. If truth be told Mohsin Charania and Lucille Cailly cruised to the heads-up encounter. In fact it seemed that the toughest task of the day was actually cutting the final deal. After a lot of negotiation the €2,400,000 was divided and the action commenced. There was tension, there was excitement, but in the end it was a case of premature cardulation as it took a matter of five hands for the job to get done. As usual it came down to a flip. The lovely ladies versus big slick. Charania holding the ladies and Cailly holding ace-king. 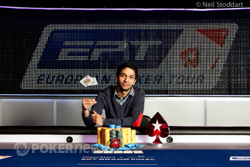 Neither the ace nor the king graced us with their presence and Mohsin Charania was crowned a worthy winner of the EPT Grand Final. Lucille Cailly raised to 400,000 holding and Mohsin Charania woke up with ! This heads-up is all over bar the shouting! Charania made it 860,000 to play and Cailly must be having kittens. After a few moments pause some words finally came out of the mouth of Cailly. "Raise," said a super cool looking Cailly - and who wouldn't be! She moved 2,055,000 across the line and Charania asked her how much she had behind. Cailly gave him a response and Mohsin went into thought mode; Cailly did not stop staring at him! Mohsin moved all-in and Cailly called instantly. Both players jumped to their feet but did stop to wish each other good luck. This is for the EPT Grand Final Championship! The flip of a lifetime and both players are seemingly praying! Cailly has missed the flop and Charania is almost there. Moshin cannot look! He is one card away He peeks...he hides..he peeks again. You can see that Cailly is begging inside. She is desperate for this. Cailly is crushed! She has locked up over a million euros and is devastated. That is how much this title meant to her. She was consoled ber her fans and friends as all of the emotion poured out. 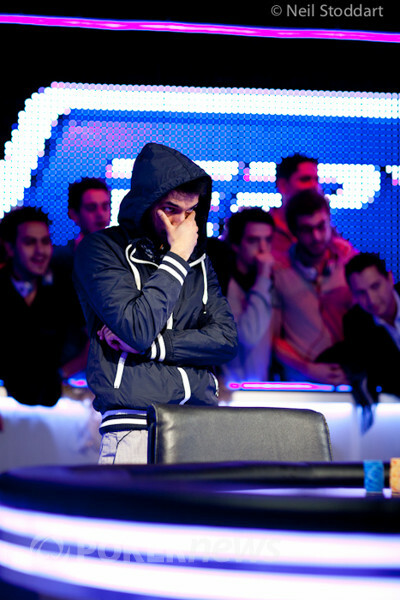 On the other side of the table Mohsin Charania has been engulfed by his rail - he has won €1,350,000 and the title of EPT Grand Final Champion. Hand #1 - Lucille Cailly raised to 400,000 holding and Mohsin Charania mucks his hand. Hand #2 - Charania raised to 410,000 holding and Cailly called holding in the big blind. The flop was and both players checked. 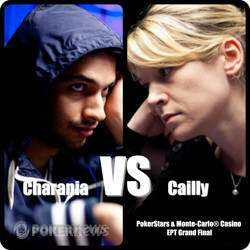 The turn was the , Cailly checked, Charania bet 330,000 and Cailly folded her hand. Hand #3 - Cailly raised to 400,000 holding and Charania called with . The flop was and Charania checked to Cailly who bet 435,000; Charania called. The turn was the , Charania checked and Cailly bet 790,000 to win the pot. Hand #4 - Charania raised to 410,000 holding and Cailly mucked her hand holding ! The deal has finally been agreed. Mohsin Charania will receive €1,150,000, Lucille Cailly will receive €1,050,000 and they will play heads-up for the additional €200,000, the title, the prestige, the Shamballa bracelet and the freeroll into the Tournament of Champions being held tomorrow. Anyone fancy playing for €1,500,000? The two players are going to talk about a potential deal so we will be resuming business very shortly. Mohsin Charania raised to 410,000, on the button, holding and Bernard Guigon found in the big blind. The nodding begins but this time some chatter from Charania brings a smile to the face of Guigon. He eventually moved all-in and Charania snapped him off. Both players wish each other good luck. In all of the excitement, the graphics did not display the river card. But that is inconsequential as Guigon is out and after a lot of consolatory hand shaking Lucille Cailly and Mohsin Charania go over to their rail to discuss respective heads-up strategy. Lucille Cailly open shipped in the small blind, holding pocket sixes, and Bernard Guigon folded in the big blind. "Are you scared to play pots with Bernard?" Charania joked. Lucille Cailly raised to 400,000, on the button, holding , Bernard Guigon folded in the small blind and Mohsin Charania three-bet to 875,000 in the big blind; Cailly folded. Bernard Guigon found on the button and...and...and...and...FOLDED! Lucille Cailly was in the big blind and she was holding pocket kings! Bernard Guigon can see people's cards! Say What's On Your Mind? 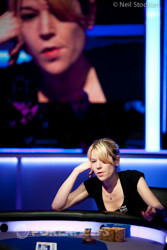 Lucille Cailly ships with , in the small blind, and Bernard Guigon folded in the big. 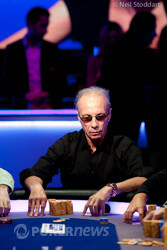 Bernard Guigon picks up , on the button, and he raised to 410,000 and both players muck instantly. "Call the floor. Bernard is bluffing again," said Charania.